The Inteli-Hybrid Generator combines a JCB Dieselmax engine with energy storage technology to deliver a hybrid power solution. Wherever there is an off-grid application with fluctuating loads, the generator can be turned off during low demand, saving fuel and reducing emissions. The Inteli-Hybrid has a number of high capacity; deep cycle battery cells which are stored in the base of the unit. 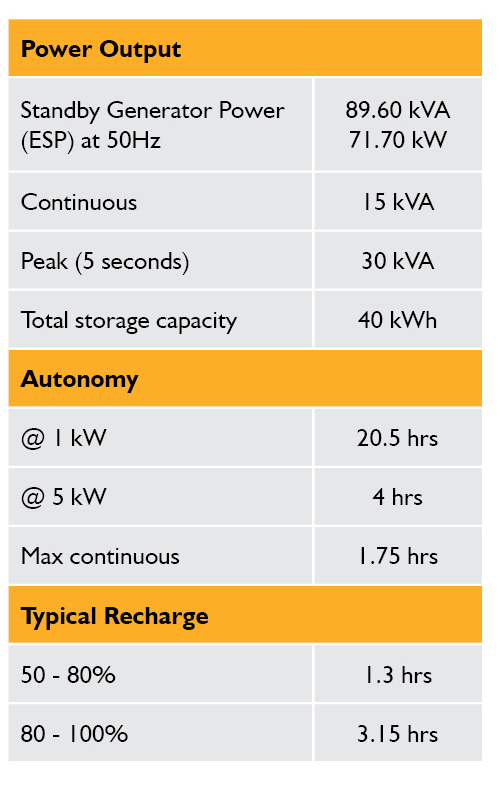 The hybrid generator eliminates waste be only running the engine to power peak loads or to charge the batteries. These batteries are charged by the generator during periods of higher load, when the engine is running at its most efficient output and during periods of low load, the engine can be stopped and the batteries continue to supply the power, increasing efficiency much like an automotive Stop/Start system, reducing fuel consumption and cutting emissions. Reduced Fuel Use: By switching between generator and batteries during varying load requirements, unnecessary engine usage is minimised. Reduced Carbon Emissions: Reduce your sites’ carbon footprint. Reduced Noise Emissions: Install in noise sensitive areas and operate through the night silently when running on the batteries. Reduced Maintenance: Reduced engine use will result in fewer service and maintenance requirements. Increased Generator Efficiency: Auto stop/start technology enables seamless power transfer to reduce engine light loading.